The INVISIO X50 offers hearing protection with natural hear-thru and the ability to control two communication devices simultaneously. Intelligence inside the INVISIO X50 control unit comes from micro processors and state of the art high speed digital signal processors allowing the user to control both hear-thru volume with super enhanced hearing and communication volume. Automatic sensing of the communication device makes it possible to swap devices on the go, without having to lose communication or situational awareness. 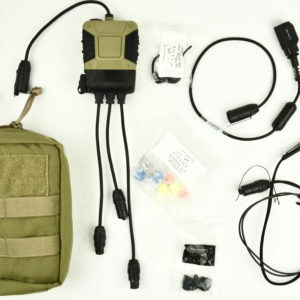 Invisio X50 Tactical Headset System comes in preowned condition. Unit has very little wear to the outside front and back. The INVISIO X50 Unit comes fully functional.